BuyCostumes.com provided these costumes for review. All thoughts are my own. Playing dress-up is a fun daily activity in our house. That’s part of why Halloween is one of my favorite holidays, I love helping my girls choose their costumes each year and helping them get all dressed up for the big day. We have school parades, parties and of course trick-or-treating where they get to wear their costumes. I do make some costumes on my own but when I shop for our costumes I always go to BuyCostumes.com. I love the selection and they have lots of great quality costumes for good prices. Check us out! This year Pinky wants to be a mermaid so we chose this adorable Mermaid Riding a Seahorse Costume. We live in Michigan so Halloween is often cold. What I love about this costume is I can layer some sweat pants and a sweat shirt underneath the costume and she’ll be nice and warm. I’m very happy with the quality of the costume, the seahorse is adorable and my daughter loves that it is made with a sparkly gold fabric. It’s super cute on and easy for her to walk in so it’ll be great for a night of great trick-or-treating. Loo Loo LOVES horses and chose this Plush Pony Cowgirl costume. The pony comes by itself so you can wear whatever shirt you want on top. Again, this is a great costume for layering warm clothing underneath without losing the full effect of the costume. Your legs go in the back legs of the horse so when you walk the horse appears to be walking. It’s quite adorable! This costume did get a little rip in the seam that I wasn’t to happy about but was easily fixable with a few stitches. Like the mermaid costume it is easy to walk in though if you have to go up or down a step it can be a bit challenging it took my daughter some getting used to but now she gets around well in it. This year I’m going to be dressing up as well. I usually at least paint my face but after I saw this Blue Yip Yip costume I just had to get it! 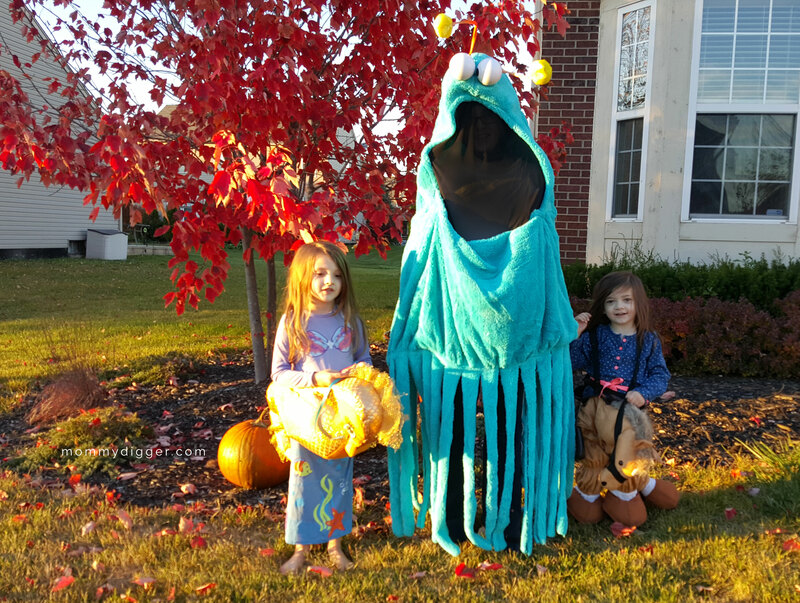 Remember the Yip Yips from old school Sesame Street episodes?! They were my favorite! Isn’t it awesome?! It’s easy to get on and has a strap to secure around your head to hold it in place. The mouth has wire so you can adjust the mouth shape to your liking. There are also holes you can put your hand through so you don’t lose the use of your hands completely while wearing the costume. It’s comfortable, hilarious and I’m excited to wear it when I take the girls out for all their Halloween events. and I had to share this outtake photo of Loo Loo doing a somersault in her cowgirl horse costume! SO FUNNY! If you’re looking for Halloween costumes check out BuyCostumes.com, they have a huge selection including this years most popular costume choices, great prices and some great coupons available.